Filipino Bloggers Group will be 10 months old next month, with 2,100 members and counting. After the Logo Design Contest, it is time to support and promote each others blog by creating a List of Best Blog in each category/niche. To start with, let us vote for the "Top 20 FBW Travel Blogs". As suggested by one of the Filipino Bloggers Worldwide member, and I quote: "I guess if we want it to be credible and erase the connotation of "BLOGGER LANG" (just blogger), I suggest criteria and standards should be duly noted, we are at a point wherein blogging is not just simply blogging but a form of media and even though we are in the internet , netiquette should be observed.". Nominees should be FBW members only. You can nominate as many as you want including yourself. Nominated blogs must be at least 6 months old and should have no less than 20 blog post since its creation. Nomination is open until next week and we will select the top 20. Then I will put it to a vote to rank the TOP 10. The winners will be the "Top 10 FBW Travel Blogs of 2012". Please nominate your favorite travel blog in the comment box and the reason why. If you think your blog should be included on the list, feel free to nominate yourself. So who are your choice for the top travel blogs? Vote for Renz Bulseco. THE GEEK TRAVEL! I also like Vivi's Random Ramblings. Great photos from different places in the world. :D I was surprised to see my photo in the blogger feed. I'd nominate my blog then. It's just six months old and has 134 posts. It contains informative tips, itineraries and reviews on Philippine and some Asian travel, extreme adventures of a thrill-seeker and freelance mountaineer, and various travel ramblings and photos. I don't strictly follow a tone, hence the posts set different moods depending on what I feel about a certain place. I am a passionate writer and my emotions are strongly conveyed in my posts. Though the blog is just six months old, it received a fairly high traffic and page rank of 2. I really don't know the reason why people read my blog but I am very thankful for that. I blog because of my love for writing and travel and I'm thankful that people appreciate that. My blog is entitled "Love Conquers All", as I do everything for the love of travel and adventure - whatever the physical or budget constraints may be. I also met the love of my life through the most death-defying adventure I had so far, in Mt. Apo, hence it was an inspiration for the blog name and for the blog itself. I've also created a post about that surreal encounter and that's my favorite blog post. 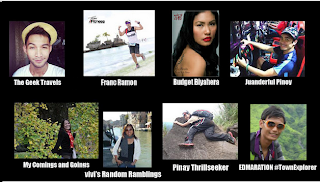 I am also the host of the Pinoy Travel Bloggers' August 2012 blog carnival which contains travel suggestions for the financially challenged or those with only 1000 pesos to spare. It is just my third month as a member of the reputable group of travel bloggers in the Philippines and it really is such an honor and an amazing experience to be the host. My vote is for Vivi's Random Ramblings she is a great story teller through her great travel pictures. I'll pick 5 travel bloggers I have constantly followed through comex thread. 1) Vivs Random Ramblings for her great photos and a large range of travel destination. 2) Budget Byahera for being able to share experience and help other travelers find cost effective means of traveling. 5) Jeffrey Riles for being able to feature unique topics and travel destinations. Of course, love your own, I'd include myself (francramon.com) for those wanting a first person perspective of the travel and feel the travel adventure as they go on reading the blog. I vote for THE BACKPACK MAN http://www.thebackpackman.com personalized account for his travels. I nominate Enrico Dee's Byahilo for reminding everyone to explore our own place first (from our town to our country's best destinations) and Bino Caina's Frameless World for giving us a window to the world. 5. Solitary Wanderer - It was through Aleah's 'Date a girl who travels' that got me all hooked with her blog.. she's always as helpful whenever I would need travel tips as well! 11. Cheap Travels For Women - Shawi is my sister from another mother! :P She has gone around the world and has always told her stories in a way that would get you all hyped again to travel.. A lovely and humble person too.. her aura truly exudes from her blog. 14. Budget Biyahera - Of course, love your own! :) I started blogging about my travels after realizing that I wanted to share the 'budget-conscious-wanderluster' in me. I would like to nominate Franc Ramon,Edmaration and Pinoy Adventurista. I find there every post interesting and very inspiring. Although i also find and appreciate other travel bloggers post but this 3 bloggers really got my attention. Great Post and Beautiful Pics. Feeling is like I want to be where they've been! Wow, thanks sa mga bumoto! But of course, I'd like to nominate a few, including me. 2. My Comings and Goings -Mhe-anne is a great traveller! I want to see places thru her eyes. She has been to places I can only dream of. 3. Solitary Wanderer - I love her travel tips, wish I can travel the world too with a limited budget! She's the most approachable travel blogger that I know. 4. Franc Ramon - Franc Is an extraordinary traveler, he was able to merge 2 passion his love for running And traveling. I always love reading his running / traveling adventures. 5. Edmaration - The town explorer! He is the only blogger that I know who visits each town and tells us the significance of the place. Makes us appreciate Our place more. Kudos Edmar! 6. Pinay Thrill Seeker - extreme travels here! She's the opposite of me, she likes the thrill of hiking and putting her life in danger, I am more laid back... I'm just scared I guess. Hehe. Thanks Cris for sharing your extreme travels! 7. Pinoy Adventurista - this guy travels a lot! Been to almost all best places to visit in our country. I always check his site whenever I need travel tips. 9. journey ni ikoy by Ricky bernardino - a new blogger here! And interesting adventures with his friends and his dog. Would love to see his blog bloom with more exposure I am positive he will make it. He is the first blogger I met on the road. And interesting indeed to share one day of travel adventure with a fellow blogger. 10 . Journeys and travels - i love the way Dr Wends share his travel tales, there's always an emotional aspect and it's a very rare read. Reading his posts about other countries makes us realize how fortunate we are as filipinos. 11. the transcendental tourist by AJ Poliquit - one of my favorite! He always put my writing to shame. Whenever you read his posts it always feels like your mom singing you lullabies, it will make you feel like you are right there and you are seeing things with your naked eye. The story is so vivid, making the scene leap out from the pages. A very very good writer... And extraordinary travel pictures too! 12. The geek traveler ( the traveling nomad) - great picture here! I can still remember his 7 super shots, which intimidated me enough that until now I have not posted mine! Hehe. Great travel tales and tips too. These are some of most active during travel comex every monday. this is good news for FBW group! Shocks I cant decide who to vote.. I think I need a review! I nominate the Pinay Thrillseeker. Thanks po sa lahat ng nag-include ng Budget Biyahera.. nakakataba po kayo ng puso! Thank you Violy Vallester for the nomination but I think I have a lot of work to do first to deserve to be included in the list. I honestly don't know who of my travel blogging friends are members of FBW. Since I saw this, can I nominate myself? teehee Not really confident but of course, I also have a different take on the places I visit. Not that much though. I'm sorry I forgot to state the reasons. Anyway, I nominated them simply because of their awesomeness! Of course of their travel tips too. Thanks for those who nominated my blog for this. I found these blogs very interesting and worthy to be nominated. I am definitely out of the circle lately so came across this nomination thread only now that the Top 20 list had been up! Thank you so much for Mai Flores (Budget Biyahera), Chris Pinay Thrillseeker (Love Conquers All) and Violy Vallester (Vivi's Random Ramblings) for the nomination and the kind, generous words!! Guess better late than never and voting continues for the Top 10. It is hard to choose only 3 but you guys have my vote!! very good blog.. especially her etxreme travels and love story.. very passionate..
vote for Vivi's Ramblin travel blog,thanks for sharing this interesting post! I'm also a blogger to write about travel. So, I really want to vote for a particular blog. I hope to read a full list of candidates in a subsequent article.